Nobody would deny that traditional recipes appeal to us all. What's more, they are a delicious combination of taste and health. 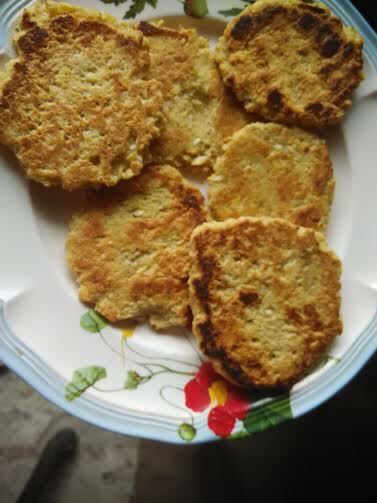 Today, I have come up with another delectable snack from the state of Odisha. Coconut is a rare commodity in North India (though it has started to become popular now), but it is a staple in coastal states of the country. Odisha is one such coastal state of India with copious production of coconut!! 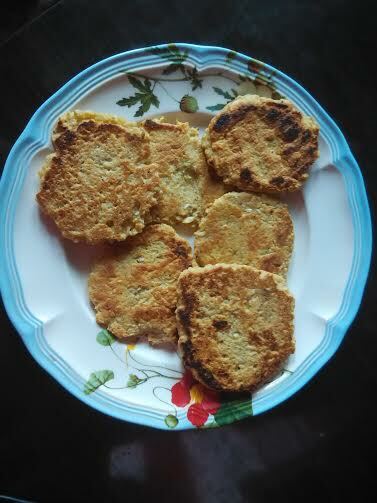 Here's presenting coconut tikki (cutlet) or nariya bhajja - as it is commonly called in Odisha. The recipe uses simple easily available ingredients at home - including ginger, garlic, besan (gram flour - besides coconut. Let's make this scrumptious snack that I usually enjoy as a side dish or accompaniment with rice. If you are using chana dal - soak it for 2 hours and then grind separately. Now mix besan, ginger-garlic paste, red chilly (green chilly), coconut, turmeric and salt. Add little water (it needs to be viscous) we do not want it to be too flowy. Grease the tawa. Take little batter in your hands and place it on the tawa. Do the same with the rest of the batter. Keep on low flame. If you wish you may sprinkle oil on the tikkis (I use little oil, so I didn't add). It will take 5-6 mins or even longer for one side to cook. Then flip the other side. Sprinkle little oil and let the tikkis rest on the tawa on a low flame. Slowly press them with a spatula. Check once done. Turn off the flame.